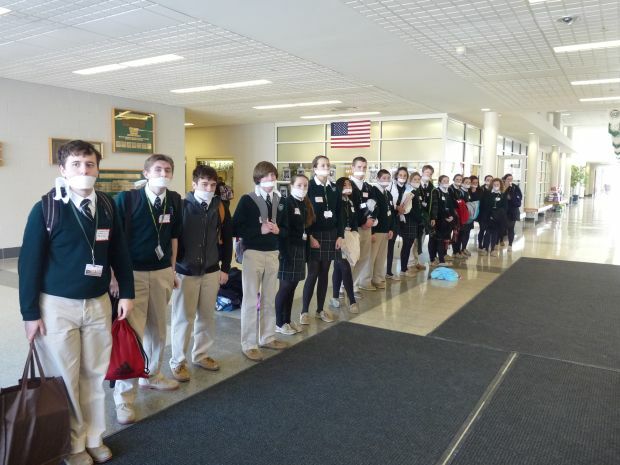 Forty Shanahan sophomores wore white cloths over their mouths for a week during Global Awareness Month, representing children who cannot speak for themselves. They not only gave up using social media for the week but they also collected and donated items to Birthright in West Chester. Tia Lewis, right, is one of 25 Shanahan seniors who portrayed homeless people during Global Awareness Month at the school. They collected donations, such as from junior Eric Moran, for Catholic Relief Services, which helps the needy in developing countries. The students also fasted from unkind words and actions. Bishop Shanahan High School recently held a Global Awareness Month which organized activities to help its students gain awareness and lend solidarity to children who suffer throughout the world. Originally scheduled for the month of February but due to many snowstorms that led to snow days and two-hour delays, the “month” stretched well into March. The event was broken into weeks with each week focusing on a different childhood global issue. On Mondays, students watched a video pertaining to the week’s topic. Tuesdays were “collection days” where students collected items and donated them to various charities. Wednesdays were “activity days” where students would perform some action that provided a visual reminder to the entire school community. Thursdays were “fast days” where students fasted from something in appreciation for the difficulties associated with that week’s particular issue. Those students who fasted received a paper “sneaker,” representing that they tried to walk in the shoes of those who suffered. Finally, on Fridays, those sneakers were hung on a “solidarity wall” and again provided a visual to the school community of the children who dealt with these issues on a daily basis. Week One focused on childhood hunger. Canned food was collected and donated to Fiorenza’s Food For Friends (F4), a charity founded by 2005 Shanahan alumnus Derek Fiorenza, which distributes food to the needy. Thirty freshman students carried signs that read, “I represent 500,000 children who died from hunger last year.” All told, they represented 15 million children. The fast this week was from food, and students who chose to skip their lunch period watched a presentation by faculty member Mary Beth Devenny who has traveled to Montenegro, Peru, to work with poor children at the Fey y Alegria School. The Shanahan students were given water and a few crackers in place of their normal lunches. Week Two focused on children who have no voice, such as those involved in human trafficking, abortion, or even foster care. Disposable diapers were collected and donated to Birthright in West Chester. Forty sophomore students walked from class to class with a white cloth over their mouths, representing children who cannot speak for themselves. Week Three’s focus was on childhood disease. Children’s hats, gloves and scarves were collected and will be donated to the St. Agnes Day Room, which helps the needy in the Chester County area. Thirty-five junior students wore surgical masks during the day, each student representing 250,000 children who die from disease each week. Students who chose to fast during the week gave up texting for the day in appreciation of the struggles of those who are ill. The final week of Global Awareness Month focused on childhood homelessness. New socks were collected and will be donated to Home of the Sparrow, a local homeless shelter. Students had the opportunity to purchase products from Ten Thousand Villages, a store supporting fair trade products. The students learned that people in developing countries who are paid a fair price for what they produce are better able to provide for their children and thus reduce poverty and homelessness in their countries. 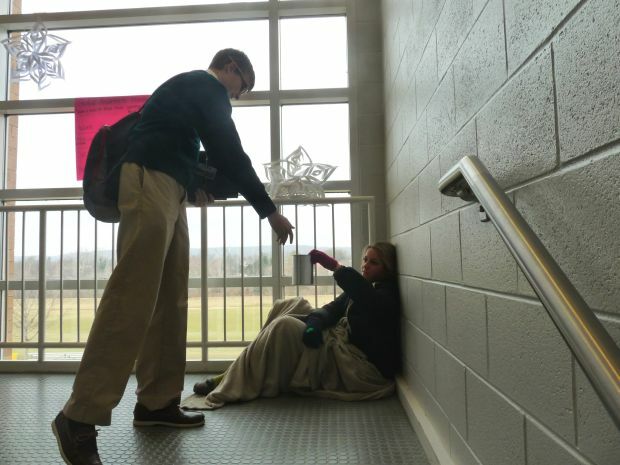 Twenty-five senior students dressed as homeless people and were positioned in the hallways and staircases for the other students to see throughout the day. Each student represented 40,000 homeless people. The $350 students collected portraying homeless people will be donated to Catholic Relief Services, which helps the needy in developing countries. The students also fasted from unkind words and actions.